...the eclectic mix in this little space. I could totally spend an afternoon reading here, could you? I love this room too. That's Ally's living room of From the Right Bank if I'm not mistaken. Charmaine, you were right!! Thank you so much!! Fabulous room. Love the contrast. the wood paneling with the art is fantastic! 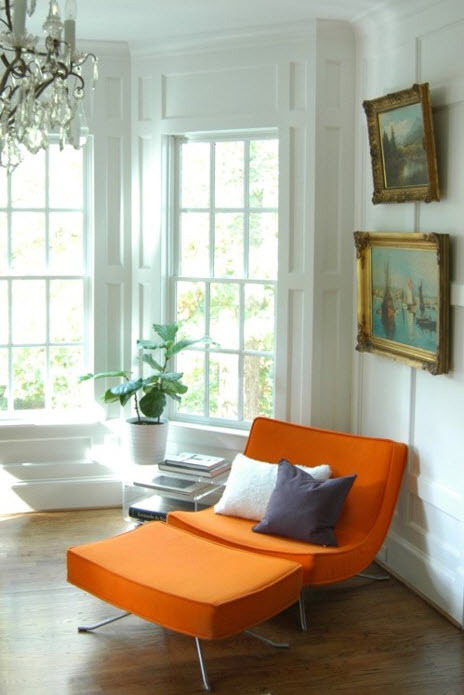 I want to be sitting pretty in that orange chair right now! Absolutely ... a perfect arrangement. Old and new -- love the contrast.